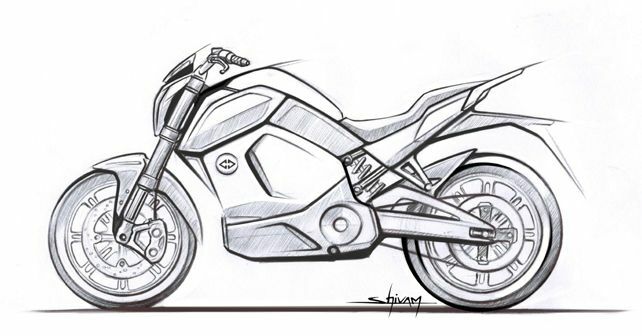 Gurugram-based Revolt Intellicorp has started building up to the launch of its first product here; official design sketch of the e-motorcycle glimpses the first look. After holding an exclusive media preview of their new product a few days back, Revolt Motors (Revolt Intellicorp Pvt Ltd) has now officially revealed the first design sketch of its upcoming electric motorcycle. While we managed to scoop up quite a few details of the product during its preview, the design sketch certainly helps us in understanding the design concept and what to expect from the production-spec version. First off, Revolt Motors has done a really good job in terms of styling, giving it contemporary & modern looks and most importantly, not going overboard with the electric theme. The e-bike can easily be mistaken for a conventional ICE motorcycle. Further inspection tells us that the e-bike will come fitted with USD (upside-down) forks and mono-shock suspension setup at the rear. Further, stopping power will come through disc brakes on either end and given that the disc brake setup is most likely to be a standard fitment, the bike might just get ABS as well. The overall riding position seems to be that of an urban commuter, with a rather flat handlebar. What we've also been told is that the bike will come with a smart remote with which the bike can be immobilised, over an above the standard ignition key. Recalling his journey designing the all-new motorcycle, Shivam Sharma said, 'It was an exciting process- designing our first EV and experimenting with entirely different dynamics. Apart from the technological prowess of the product, the stance and riding position make it a perfect everyday commute. It took us six months, three different directions and seven mock-ups to finally arrive at the design you will see coming alive soon. As mentioned previously, Revolt Motors will launch its first offering in India in June 2019, with a multi-product portfolio due to launch in the subsequent months.